Ultrasonic Parts Cleaners. SharperTek® engineers are experts in the design and fabrication of ultrasonic cleaners, degreasers and washers – we will work to any specifications at no additional cost. 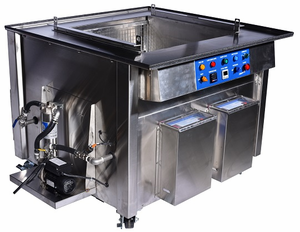 All of our large and industrial ultrasonic cleaners are fabricated in the USA and feature multi-frequency ultrasonic technology, ultrasonic cleaning with sweep technology, stainless steel construction, ball valve drains, and optional filtration systems. We can vary ultrasonic and heat power to match our customers' needs. The units listed below are an example of sizes and costs for standard systems. Side handles for easy handling or forklift Base depending on machine size. Heating element for best cleaning results. Heating element can stay on all day even if ultrasonic power is off. Ultrasonic Timer with Power Adjustment. Digital Temperature Controller with safety max temperature shut off on units 20 gal. and above. Power outage safety unlatch feature. Industrial-Grade Transducer for best reliability. Drain Faucet for spill-proof draining. Ultrasonic Frequency: 28 / 40 KHz Per customer requirements. Adjustable feet provide stabilization and prevent rocking. Quickly degases in 30 minutes. Power Supply AC 110or 220V, 50 / 60Hz. Temperature Rating 160 Degree F max. 170 Degree F Max. 210 Degree F Max. * Note; Please use the drop down menu to chose the type of Sonics that best fits your needs. A "None" selection would provide you with just the heated tank.